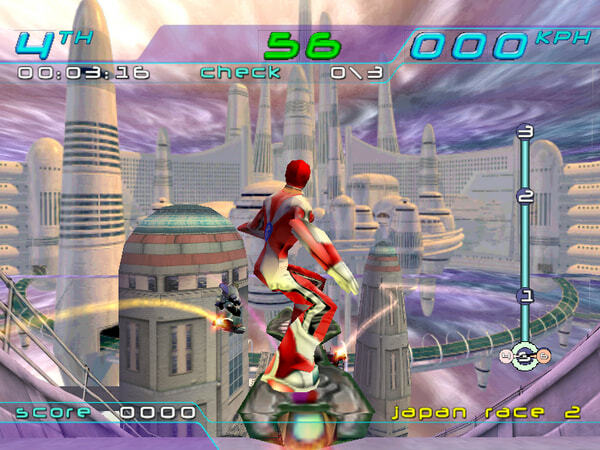 Race and learn to do tricks on your futuristic hoverboard to win the Trickstyle Pro-Tournament in Criterion’s first Dreamcast game. Trickstyle is set in a future. In the year 2099, tensions between the nations of the world grew to an insane limit This soon led to an Dominance War which led to a serious amount of bloodshed and tears dropped. The governments lost their power, with the few remaining ready to protect earnings and put an end to the violence. This led to a promise of a new world. One that everyone could live peacefully and joyful of what lies ahead. This new world would be put into works as the Reconstructive Age. As the mess of the bleak and wasteful Dominance War ends, a new civilisation, bright and colourful begins. In the Reconstructive Age, help was certainly on the horizon. Small companies with little power during the war, such as the Jugaku Corp became rich and famous during the war as they developed the anti-grav technolgy to build up funds. Eventually creating the much demanded Hover-Ride. This made Jugaku the most successful company during that era with them having the most power, money and resources. No one could match their success back then, and at the date Trickstyle is set, they still couldn’t now. However Jugaku were a tainted company who caused disasters with their technology, such as the infamous moon base explosion. This horror cause the moon shift on its axis and mass floodings increased everywhere. Bizzarly however, Jugaku were the heroes of this problem as they were ordered to clean up the situation to develop floating platforms for a whole city. They built a Hover-Ride base for Ariel Tokyo winning back the public’s heart. Following the floodings, the One World Confederacy (OWC) was formed. With Jugaku calling the shots and every remaining governement signing up. This new Utopian age promised those who lived in it a perfect society. Crime was unrealistically low, people didn’t have to work and everything was made readily available for those living in the new society. The only thing asked in return was loyalty and obedience, which was considered a very small price to pay for such a wonderous living condition. However despite this, people still lived in poverty and terror due to The Fettered States who didn’t join up in the OWC. Places like Belfast, Amsterdam, Moscow and Bangkok existed as a place for bandits, mercenaries and lawless states to roam free among the unlucky people who lived there. The OWC did have problems of its own however. Where the few people worked full time, most people stayed at home, bored out of their minds and looking for a way to enjoy themselves. Then came hoverboarding, a dangerous, but ultimately blazing fast and exciting sport for the kids who had nothing better to do. It was considered cool and a way of stopping problems such as riots, strikes and rebellions. Jugaku noticed this and turned hoverboarding into a competiton, a competition known as the Trickstyle Pro-Tournament. The tournament provided athletes everything they needed to compete: prizes, facilites and equipment. The first winner of the competition was a man named Shin, who continued to win it five years in a row. He also became the first and last Jugaku sponsered athelete. The races were everywhere, but the real home of hoverboarding was ariel Tokyo, where the last race is always held every year. Thousands of people across the globe make the journey to see the last race, just simply due to the significance it has on the tournament. In fact, the reward of this Trickstyle is the prize of being the mayor of any OWC city of the winner’s choice, just to add excitement and hype over the eventual end of the events in the game. Compatibility Notice: Integrated Intel Cards are not supported. Multiplayer Notice: Only local 2-player mode is available – requires a gamepad/joystick for the second player. Style. Speed. Psycho-stunts. Spectacularly sick visuals. TrickStyle takes you on the race of your life! 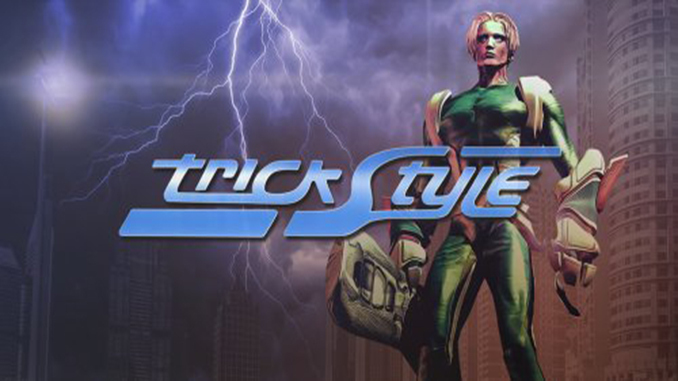 Unlike traditional racing games, TrickStyle’s gameplay is based on the use of hundreds of stunts in order to win the game – in both single-player and multi-player modes. Gamers not only have to be fast, they have to master the game’s stunts as well, thus allowing gamers to speed up, access shortcuts and slow opponents down while racing on futuristic hover boards. 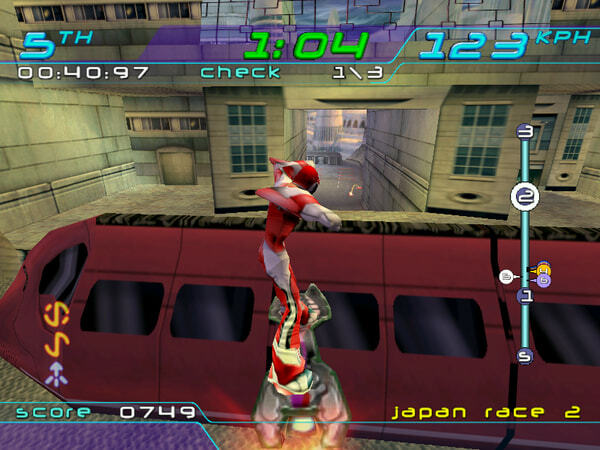 In addition to a huge velodrome (a skate park designed just for air surfers), gamers can race through gorgeous futuristic renditions of Tokyo, New York City and London. Each city is recognizable by its famous landmarks, and boasts unique challenges, such as avoiding traffic and pedestrians in bustling Manhattan. 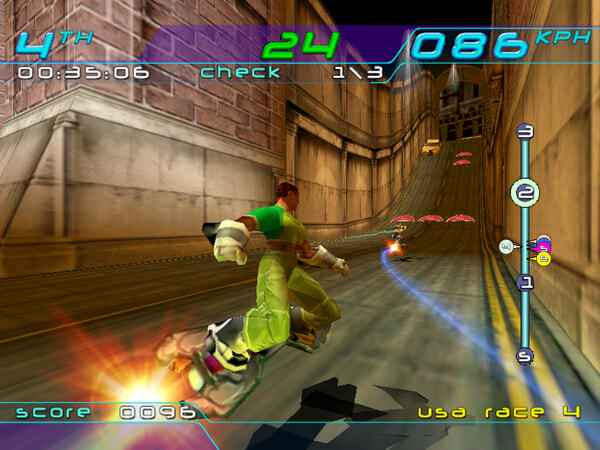 In addition, TrickStyle uses a node-based racing system, which allows gamers to create their own paths through the cities. Please add Far Cry 5!